Remember the first time you saw your spouse? The paralyzing sense of “Do they like me”? If you missed the last seminar and want the Relationship Rejuvenator E-Book designed to rekindle your Relationship with strategies that really work, it's instantly yours for the cost of that glass of wine you'd otherwise might use for temporary relief? Remember all the other fun parts that went into those first few moments of connecting with your life long partner. You got together for a reason. You may not have been able to breathe if you couldn’t spend the rest of your life with each other? … you’ve found yourself in a substandard relationship and lost “the spice”? So if YOU’RE no longer enjoying a dynamic and flourishing relationship, it’s all become bland, you’re probably in need of a serious upgrade! Especially if you’re noticing there are way more days you’re feeling trapped, lonely or isolated than the tasty, joyous loving ones. If you’re reading this, you still have access to that wonderful vitalised relationship you may have once enjoyed. You’ve probably both overlooked to service your back ground running motor – the same as your cars! All you need is an expert Relationship “mechanic”, so you’re literally minutes away from that jump start! ... with absolutely no complicated hoo ha – just researched, proven strategies to get your started from an experienced specialist. PS. Is it possible you’ve tried a few tactics before, maybe even tried a Marriage Counsellor? Please know it’s worth your time investment to persist with Specialist material that works. Research shows you’ll live longer and healthier in a flourishing relationship. 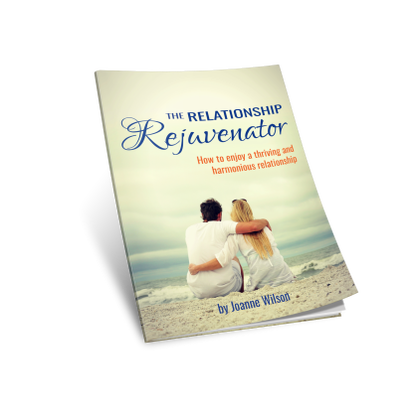 Start with the Relationship Rejuvenator E-Book for less than two coffees! A beautiful research project conceived over twenty years that features well over 2,000 years of collective knowledge to inspire longevity in relationships. 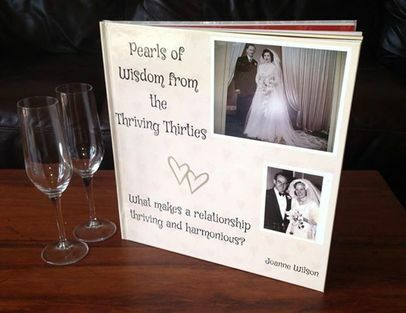 This beautifully presented hardcover photographic book of 30x30 cm in size and includes unique, touching Pearls of Wisdom from married couples married more than Thirty years. There are added valuable tips and prompts that will inspire and motivate. Couples seeking a refreshing insight from those who've lasted the distance! Local residents who prefer to avoid postage costs may choose from the following options upon which you will be provided with full collection details. ​Your own private Counselor can also be found in these great books WE recommend!